And may your St. Patrick’s Day meal be blessed with an abundance of richly flavored Irish Butter! Preheat oven to 350 degrees. Use paper toweling to completely dry the lamb before browning. Into a Dutch oven with a tight fitting lid, add Irish butter and olive oil on medium heat, once butter is melted and hot, place in the lamb, browning well on each side before turning over. Remove lamb to a platter. Reduce heat to low, add in the onion and cook for a few minutes until turning translucent then stir in the garlic and rosemary, cook another 2 minutes. Cut browned lamb into cubes and return to the pan along with any juices remaining on the plate. Pour in the wine or beer, increase temperature to medium high heat and cook for 3-4 minutes until reduced then pour in the beef stock. Cover pot and place into oven for one hour and fifteen minutes. Remove pot from the oven and tumble in the turnips, carrots, crimini mushrooms, and frozen pearl onions in cream sauce, stir through, cover pot with the lid and return to the oven for another hour. Remove pot, stir in peas and parsley, sprinkle with salt and pepper, taste, adjust seasoning. Keep stew hot on very low heat until ready to serve. Serve aside hot mashed potatoes prepared with Irish butter and finely chopped scallions. 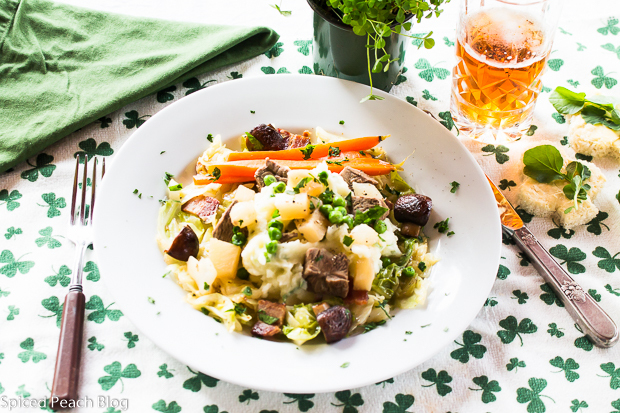 This entry was posted in Meats and tagged Happy St. Patrick's Day, Happy St. Patrick's Day 2016!, Lamb Stew, Lamb Stew recipe. Bookmark the permalink. Post a comment or leave a trackback: Trackback URL. I ate a lot of Irish stew in Dublin. It’s one of my favorites. 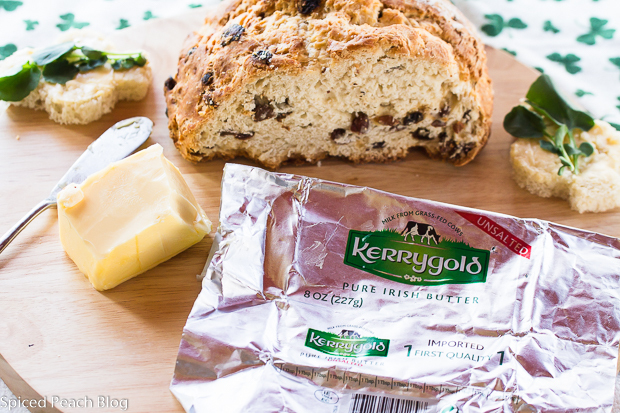 We love Kerrygold butter too. We use the spreadable blend for spreading and the sticks for baking. Their aged cheddar is exquisite. Happy St. Patrick’s Day, Peggy. Ah Kelly, sounds wonderful. I do love stews and lamb stew is among my favorites with mashed potatoes, or even reversed as shepherds pie! I’m with you on the Kerrygold butter, it has such a lovely creamy flavor and I love the golden color. The kids had half day today and loved spreading it on Irish soda bread. I also buy the cheddar and enjoy it very much as well (including shredded in dishes as it also provides a nice taste combined with ingredients.) Happy St. Patrick’s Day to you too, and Antonio! This is beautiful Peggy and the recipe doesn’t look too difficult either. It might be a nice spring dinner on a Sunday and we will probably have some more cold days for stew too. See you at the market. Thanks so much Arlene. The stew is not difficult at all, just a bit of browning and the rest is adding on into the pot, well, all except whipping up a nice batch of creamy mashed potatoes. Slainte! Nice presentation. The stew with mashed potatoes looks delicious. I’m printing the recipe for future use. Thanks so much Meredith. I’m sure you will enjoy preparing it, not too many ingredients and very delicious. Thank you for stopping by. Dear Peggy, looks like you had one delicious Saint Patrick´s Day! Stew, Irish soda bread and lots of creamy and rich Kerrygold butter. Who could ask for more?! 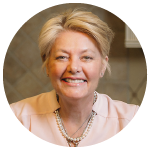 Hi Andrea, thanks so much and I will be saying that the lamb stew with the mashed potatoes was a knockout, so good! I also served sauteed bacon and cabbage and this surrounded the outside of the plate. 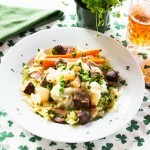 My grandson’s buddies loved it too so all in all a lovely, lucky St. Patrick’s Day feast! See you soon.